Life is busy - there is always something happening, something new to experience - some new delight to breathe into our world. We are forever being told to "take a deep breath", to "listen to our breath", to "just breathe", to "breathe it all in". It seems to me that the focus is on sucking it into ourselves, drawing all we can from what is on offer and filling ourselves with all that comes our way. What I've been wondering lately is.....what do we do with all that we've breathed in? WHAT DO WE DO WITH OUR INHALATION? Do we hoard it all to ourselves? Do we gorge ourselves on all life provides and then sit back and digest it? Do we inflate ourselves full of experiences and just accept everything that we're given? Have we become inhalers of everything and exhalers of nothing? Are we saturated, and overfull, and overwhelmed? "Just let go, let His love wrap around you, And hold you close. Get lost in the surrender, Breathe it in until your heart breaks, Then exhale, Exhale"
I began thinking about how it is just as important in life to Exhale - both the good and the bad. We need to breathe some of the stress out of our lives, to breathe out all the pent up emotion and let it pass from us. We need to drop our shoulders, relax and just let it fall away - consciously breathe it out of our system. We also need to exhale some of the blessings that we've breathed into our lives. We are given so much and it benefits us to share some of that with others and not hoard it all to ourselves. We breathe life into our relationships - not by always sucking in, but by breathing out - resuscitation is all about breathing into another person and we do that by exhaling from ourselves. 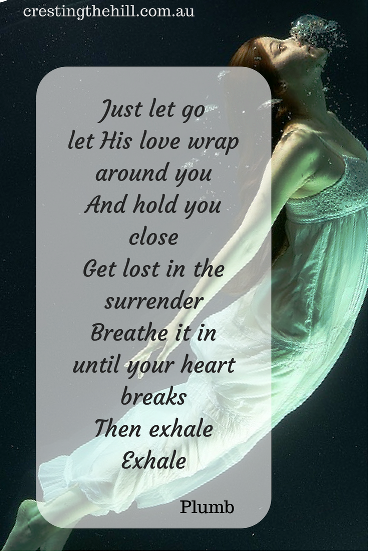 Life is all about inhaling, breathing in all that it has to offer - but perhaps we need to slow down a little and think about balance and breathing some of it back out. 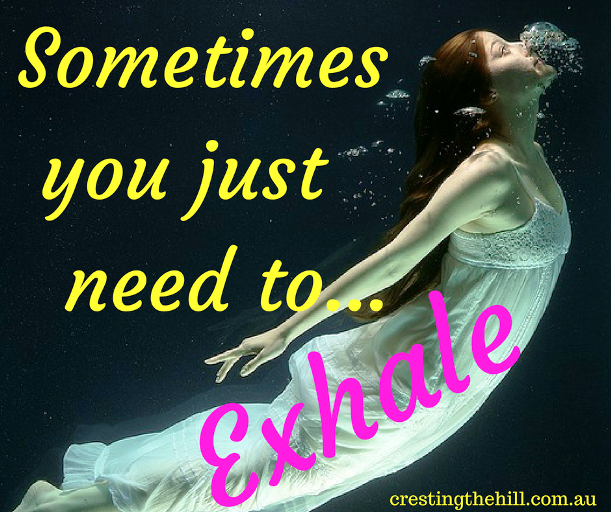 I think we need to remember to "Breathe in.......and then Exhale". So very true. Sometimes just sitting and breathing in and out slowly for a few breaths helps to ground me when I'm feeling overwhelmed. Sounds like an interesting song. It's a lovely song Ness and you're right about just taking the time to breathe making all the difference sometimes. 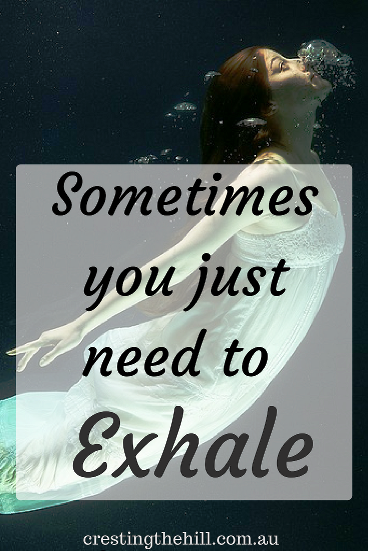 I have learned so much about how my breathing changes in the past few years and how I can make a difference to my inner world by changing the breath routine. It is a marvellous resource and without it...well, then..not 'here', any more ....Thanks for linking up for #lifethisweek 13/52 Next week: Daylight Saving is Over. It's nice to think that something so fundamental to life can also make a difference to our quality of life isn't it Denyse? Thanks so much Phaytea - the song just made me stop and think about how important it is just to breathe out now and then. So true Leanne. I guess the assumption is when you breathe in you will exhale. I think there is a difference between breathing out and exhaling and your post resonates with that concept! You nailed it Haralee - it's about a conscious breathing out of the stress and also the blessings - we're so busy sucking it all in, sometimes it's nice to just let some of it out. I think we tend to hold our breath - literally and figuratively - too often Renee - it's so nice when we just relax and breathe out. One of the mantras that I like to use when I'm meditating or doing yoga is to inhale peace and exhale love. That is a perfect summing up of it all Jennifer - breathing in peace but also sharing the love - not hoarding it all to ourselves. I definitely need to exhale. And inhale. Well, ok, both then. I need a break! Good advice. I never knew how breathing-challenged I was until I saw a labor coach before our first daughter was born. I never knew how we can "forget" to breathe properly, especially when stressed. The same can be said for how we perceive life, walk through it, and then give back to ourselves and others. That's it in a nutshell Susan - it's about sharing ourselves and not holding all that we take greedily to ourselves. We keep breathing everything in, but do we ever think to let some of it out again? I'm on the Yoga thing again Leanne! But an important part of yoga is breathing - not just inhaling but exhaling. We do talk a lot about taking a deep breath when we are stressed for example, but it is the exhaling that really releases the tension. Balance is the key but in this world it isn't that easy to achieve. Have a grate week. Yep back to balance every time isn't it Sue? We are so quick to take everything into ourselves, but we forget that it isn't good for us, and it needs to be balanced by giving some of back to the world around us. 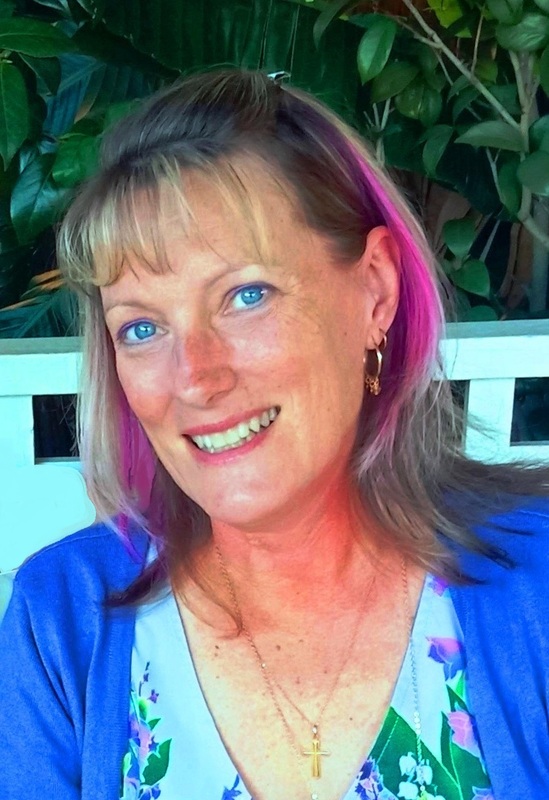 Another good reason that you should write a book :) Thanks Leanne for sharing this post at the #WednesdayAIMLinkParty. I shared it on social media. A key to yoga is that "if we are not breathing, we are not engaging in yoga...regardless of how perfect our poses may seem". Your post is a great reminder of the importance to 'just breathe'! Thanks for sharing this. I keep meaning to have a go at yoga - I think it would be the perfect Midlife exercise regime - just have to get my act together long enough to make a start! You brought back some memories with your comment about pre-natal classes Kathy - I remember all the focus on how important breathing was to get you through the pain. It has a huge impact on us without us even realizing doesn't it?